There are many new faces since the 2005 election. On the nationalist side, both Francie Molly and Michelle O’Neill have stood down from Dungannon Council to concentrate on Stormont. Selected to replace them are newcomers Padraig Quinn and Joe O’Neill, who are running alongside current councillors Dessie Donnelly and Mickey Gillespie. Outside of Sinn Féin this will be first time that the name Jim Canning hasn’t been involved in a local election for over 30 years after the Coalisland man passed away in 2010. While he wasn’t elected in 2005, Jim had a substantial vote, which many of the nationalist parties will be hoping to take a share off. The SDLP are running party veteran Jim Cavanagh who has been on the council since the 70s. On the unionist side, the DUP are putting forward Johnny Chartres while the UUP are hoping that Kenneth Miller can hold the seat won by Norman Badger after being co-opted onto the council in his place three years ago. Rounding off the fight for seats are two independents, James Walshe and Patricia Campbell. 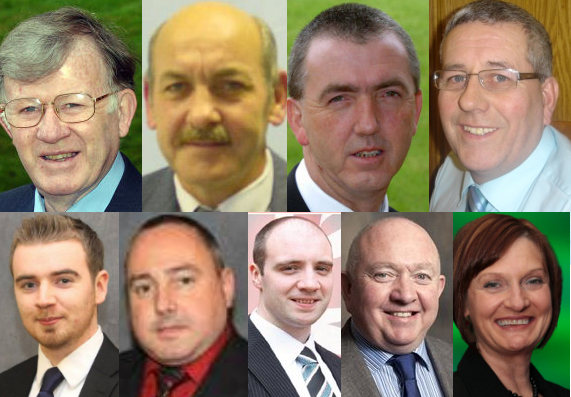 One look at the party names running for Torrent and you would be forgiven for thinking that it’s just a smaller version of the Mid-Ulster Assembly clash – and indeed Sinn Féin would be happy if they could mirror the 2005 Torrent result at Assembly level. It’s hard to see any changes taking place here. Sinn Féin will be pretty confident of securing its four seats again, shown by the fact that they haven’t felt the need to co-opt any of the new candidates to replace O’Neill or Molloy earlier to help them build up a profile, like the UUP did with Miller. There are however a number of issues that may affect the Sinn Féin vote. They had comfortably a quota for four seats in 2005, but this time they face a challenge from Patricia Campbell, who is running as an independent republican. Well known in her local area around Derrytresk, it will be interesting to see how many republican voters there are that have become disillusioned with Sinn Féin over the last six years. She seems to have linked up with Barry Monteith – who is running for election in the Dungannon Town electoral area – but unlike him she has not had a council seat to gain publicity from nor a big enough local base to build on. She could struggle to get enough first preferences to keep her in long enough to benefit from republican transfers. Another issue that may affect the Sinn Féin vote is the Coalisland Canal. This has been a major issue among many people in Coalisland and the surrounding area with a proposed new supermarket being seen as a threat to its future restoration. Sinn Féin have been viewed by some as taking the side of the supermarket and the issue has been strong enough to see another independent, James Walshe, throw his hat into the ring to run on the issue. James will be hoping to inherit the old Jim Canning vote who fronted the canal restoration most of his life. This will be a big ask and again he may struggle to gain enough first preferences to help him benefit from transfers. A big portion of that vote could transfer over to the SDLP’s Jim Cavanagh – as Canning’s transfers in 2005 mostly benefited the SDLP – who has also been fighting on the canal issue. It is however hard to see there being enough transfers to help Walsh challenge for a seat. The unionist battle remains the same, with the UUP comfortably ahead of the DUP and, barring any meltdown in the Unionist vote, Miller should be elected, albeit needing DUP transfers. The Torrent Ward will more than likely see no change in its makeup, with Sinn Féin capturing its four seats, and the SDLP and UUP re-claiming a seat each. It will however be worth noting the performance of the independents and watching how much they will affect both the SF and SDLP vote. If there is any slippage of votes between the unionist candidates, the independents could sneak a seat, but this would be unlikely. While many independents benefited in the Irish general election a few months ago, the tribal nature of the North’s politics will make it hard to see any local candidates making a big impact.